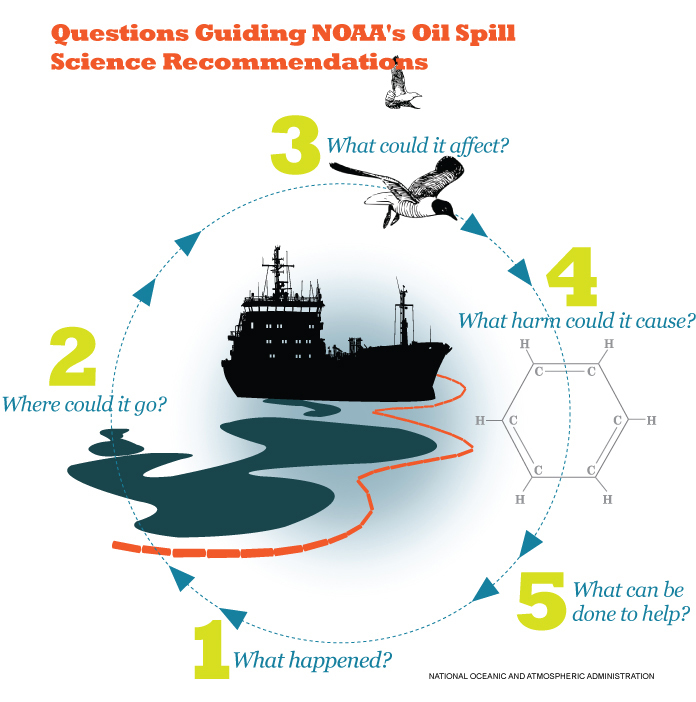 MAY 7, 2015 — During an emergency situation such as an oil spill or ship grounding, scientists in NOAA’s Office of Response and Restoration are guided by five central questions as they develop scientifically based recommendations for the U.S. Coast Guard. 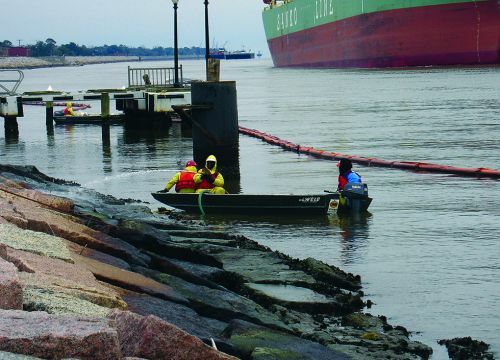 These recommendations help the Coast Guard respond to the incident while minimizing environmental impacts resulting from the spill and response. Identified in the late 1980s by NOAA, these questions provide a sequential framework for identifying key information at each step that will then inform answers to subsequent questions raised during an oil spill. For example, in order to predict "where could it go?" (question two), you first need to know "what spilled?" (question one), and so on. Naturally, during a spill response, it may become necessary to revisit earlier questions or assumptions as conditions change and more—or better—information becomes available. the type of incident (e.g., pipeline rupture versus oil tanker collision). the volume and types of oil involved. the incident environment (e.g., stormy, calm). the incident location (e.g., open ocean, near shore, water temperature). Dr. Amy MacFadyen is a NOAA physical oceanographer who frequently works on the next step, which is predicting where the oil is going to go. In most of the spills we respond to, the oil is spilled at or near the water surface and is less dense than water. Initially, the oil will float and form a slick. Dr. MacFadyen looks at what is going on in the environment with wind and waves, which can break up the slick, causing some of the oil to mix into the water column in the form of small droplets. An important point is that responders can potentially clean up what is on top of the water but recovering oil droplets from the water column is practically impossible. This is why it is so important to spill responders to receive accurate predictions of the movement of the surface slicks so they can quickly implement cleanup or prevention strategies. In order to make predictions about oil movement, Dr. MacFadyen uses a computer model which includes ocean current and wind forecasts to generate an oil trajectory forecast map. Trajectory forecast models may be updated frequently, as conditions at the site of the spill change. Although the trajectory map shows the position of the oil, there is an element of uncertainty as the forecasts are based on other predictions, such as weather forecasts, which are not always perfect and are themselves subject to change. To reduce uncertainty, trajectory forecasts incorporate information from trained observers flying over the slick who can confirm the actual location of the oil over the course of the spill response. MacFadyen can then incorporate that updated information as she runs the trajectory forecast model again. In order to answer what the oil might affect, NOAA developed Environmental Sensitivity Index maps to identify what might be harmed by a spill in different habitat types. It is necessary for responders and decision makers to know what shoreline types exist in the path of the oil, as well as vulnerable species and habitats so that they can plan for the appropriate protection (such as booming) or cleanup method (such as skimming). Cleaning up oil off a sandy beach is very different than a salt marsh, mudflat, or rocky shore. Animals, plants, and habitats at risk can include those on the water (e.g., seabirds), below the surface (e.g., fish), and on the bottom (e.g., mussels), as well as on the shoreline (e.g., marsh grasses). Jill Petersen, manager of the Office of Response and Restoration Environmental Sensitivity Index map program, works to ensure that these maps of each U.S. coastal region are up-to-date so that this information is readily available should a spill occur. The next step is to look at what harm the oil could cause. When oil is released into the water, it can cause harm to marine animals and the environment. Oil contains thousands of chemical compounds. Polycyclic aromatic hydrocarbons [PDF], or PAHs as they are commonly known, are a class of oil compounds that have been associated with toxic effects in exposed organisms. Because of this, scientists frequently study PAHs in spilled oil to gauge the oil's potential environmental impact. However, the complexity of each oil's chemistry and the changes that occur once it is in the environment make the assessment of risk a challenging task. In order to do so, response biologists consider the type of oil, the sensitivity of potentially exposed organisms, and how the oil is expected to behave in the environment. Oil spills can involve releases of large volumes of oil that overwhelm whatever natural capacity there might be to absorb impacts, which leads to the photographs we see of heavy oil covering plants and animals. But recent research studies have shown that even minute amounts of petroleum can harm marine eggs and larvae—which means the decisions we make during a response are even more critical to the long-term health of the affected habitats. NOAA marine biologist Dr. Alan Mearns is an expert on how pollution from oil harms the environment. Each year, he reviews and summarizes recent research in this field to ensure oil spill response recommendations and decisions are based on the most current science that exists. Answering the previous questions allows us to determining what can be done to help. Doug Helton, the Office of Response and Restoration’s Incident Operations Coordinator, describes possible solutions as usually falling under three categories: containing the source, cleaning up, and protecting the shore. To contain the source means to limit the further release of pollution by plugging the leak in the pipeline or containing the spill, for example, by keeping the ship from sinking and losing its entire cargo of oil. 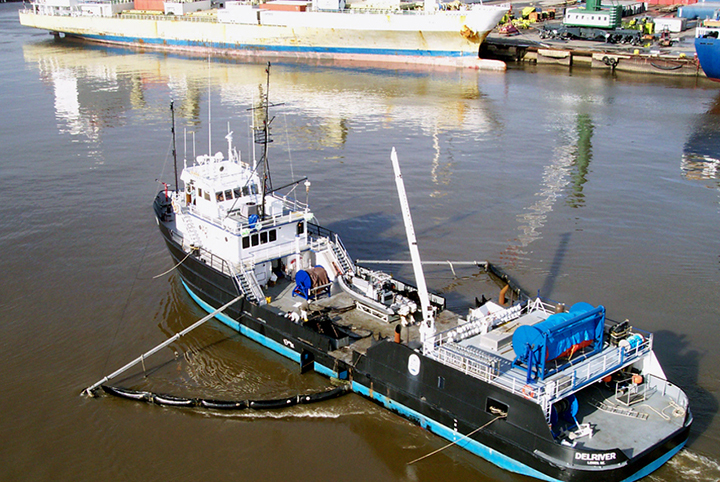 Cleanup on the water could be conducted by mechanical means, such as booming and skimming, or through alternative technologies, such as burning the oil in open water or using chemicals to disperse the oil. Cleanup along the shoreline can be done manually or mechanically using methods such as pressure washing. When considering cleanup options, sometimes monitoring the situation is the best option when a response method could actually cause more harm to the environment. One example is in an oiled marsh because these habitats are especially vulnerable to oil but also to being damaged by people walking through them trying to remove oil. In addition to providing scientific support to the U.S. Coast Guard, NOAA's Office of Response and Restoration develops oil spill response software and mapping tools. For responders, NOAA has published a series of job aids and manuals that provide established techniques and guidelines for observing oil, assessing shoreline impact, and evaluating accepted cleanup technologies for a variety of oil spill situations.